Much like the dragon, there were a few other creatures supposedly to be in Unreal1 that never made the cut... but are often discussed in certain forums. I haven't tried this yet, obviously as I'm at work. Anybody wanna give it a shot? Tried it in a couple of maps in Unreal Gold (it doesn't work in UT) - was able to summon the CutSceneGargoyle (which is just a decoration) but not the Gargoyle - got a console error that it could not be spawned. No errors or warnings in the log though - perhaps I tried to summon it in the wrong place? OjitroC wrote: perhaps I tried to summon it in the wrong place? Don't think that's possible, unless you tried to spawn it outside the boundaries of the map. I'll give it a go tonight; try a map edit with it directly on it somewhere. Maybe it's the same error as the original dragon, which also didn't work until a couple people re-modeled it. It's just that on a couple of previous occasions I have tried to spawn a monster (for example, the larger PSXMinotaur or the Elephant) and it hasn't worked, and then I realise I'm probably trying to spawn it in an area which is too small for it. Monsterspawn usually manages to spawn these somewhere on the map. I thought possibly the same thing happened with the Gargoyle. Will be interesting to see how you get on with it. Okay, I never saw the minotaur but I'm familiar with the elephant. Elephant came out in a release with a lot of other animals, like wolves & bulldogs & pigeons, and they all had a problem being spawned into games. There was a way to configure UT to make them playable but it was extreme and ridiculous and I didn't think it was worth the effort. Although, I rather regretted not being able to use the cow. Perfectly normal Earth-cow that pooped toxic cow-patties that were deadly to anyone nearby. This screenshot (extremely cropped for... no reason) gives the basics. Turns out the original download was for Unreal1... there's now a new one at the link at the start of this thread specifically for UT. It flies, but not too fast. It has 2 attacks, a slow moving energy ball that makes a BIG boom... and a beam weapon. Not sure about melee. Still running tests on it. It's a little bigger than a Warlord. Or it just seems that way as it's not as bulky. Very cool release. New vintage! 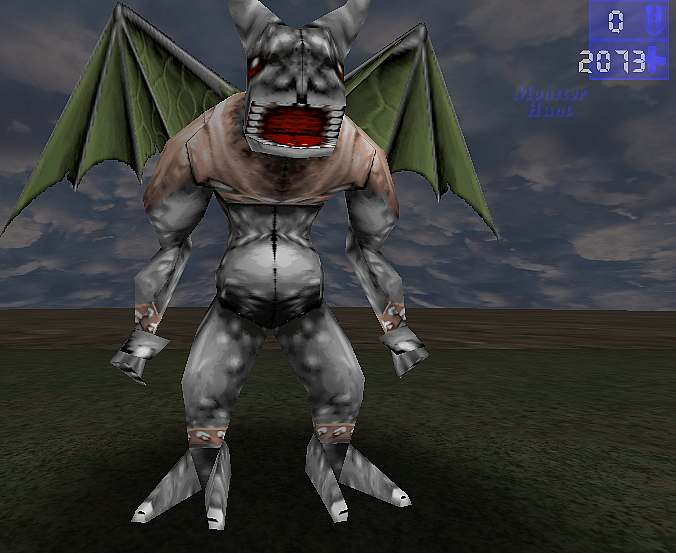 The texture needs work ...it looks more like a very dumb grey devil. papercoffee wrote: The texture needs work ...it looks more like a very dumb grey devil. And its hands are way too small for its body. Also kinda looks a little constipated.